An experimental fabrication technique has created perfect absorbers for small bands of the electromagnetic spectrum from visible light through the near-infrared. The technique could allow advanced thermal imaging systems to be produced more quickly and inexpensively and with higher sensitivity. 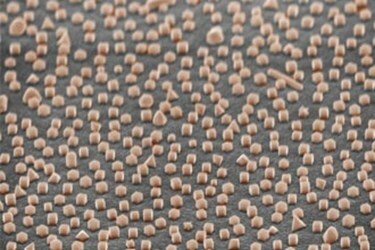 It holds potential for a variety of other applications, such as masking heat signatures, and is easily scalable, can be applied to any surface geometry and costs less than current light-absorption technologies. 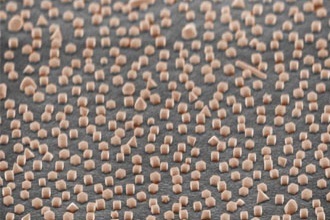 The technique relies on plasmonics and was developed in the lab of professor Maiken H. Mikkelsen in the department of electrical and computer engineering and physics at Duke University. To fabricate the absorbers, researchers first coated a surface with a thin film of gold. They then applied a layer of polymer a few nanometers thick, followed by a coating of silver cubes, each one about 100 nm in size. Dip-coating methods were used. When light struck the engineered surface, a specific wavelength was trapped on the surface of the nanocubes in the form of plasmons and eventually dissipated into heat. By altering the thickness of the polymer film and the size and number of silver nanocubes, the coating could be tuned to absorb different wavelengths. "The unique absorbing properties of the nanocubes can be predicted with straightforward formulas, making it easy to quickly determine recipes for surface coatings that provide desired spectral properties," said professor David R. Smith. "The nanocube system eliminates, or at least vastly reduces, cost and manufacturing issues, so that we can focus on impacting exciting application areas such as photovoltaics or thermal coatings." By making the nanocubes larger to absorb wavelengths corresponding to thermal radiation, the technology could suppress or mask an object's natural thermal radiation, also known as blackbody radiation. Coating photodetectors to absorb only specific wavelengths of IR light could enable novel and cheap cameras that could image portions of the IR spectrum. Among the researchers' next steps is to convert thermal radiation to an electrical signal.